I was not conscious of the Dungeon Roll Kickstarter back when it was spinning its fundraising wheels in early 2013, but that’s okay. Everything worked out thanks to 10,000+ backers, and I still stumbled upon the game later in life, in its natural habitat, sitting side by side other various board and dice games in my local Barnes and Noble. It’s one of the sections I gravitate towards first, followed by the new book releases in science fiction and fantasy. Naturally, competition is fierce, but I was drawn to Chris Darden’s Dungeon Roll for two reasons: one, it can be played solo, and two, it came packaged in a tiny treasure chest. Let me put on all of my DM accessories and tell you all what you ultimately do in Dungeon Roll. This is bite-sized dungeon-crawling adventure with all the traditional D&D wrappings, such as battling monsters, gaining experience points, and grabbing loot. The player’s goal is to collect the most experience through these main actions, and each player randomly selects a hero avatar card at the start, such as a mercenary, half-goblin, or enchantress, which provides unique powers and abilities that will definitely affect how far you can go into the dungeon in each run. My personal favorite is the knight/dragon slayer. Players take turns being the main adventurer, boldly entering the dungeon in hopes of fame and fortune. Or you can play by myself and see how far you can push your luck. However, before you enter the dungeon proper, you need to assemble your party by rolling seven Party Dice. Your party can ultimately include clerics, fighters, mages, thieves, champions, and scrolls, all depicted appropriately on the dice via painted debossed faces. Another player (or you can do it yourself when playing solo) takes on the roll of the Dungeon Lord and rolls a different set of dice to create oppositions in each level of the dungeon, based on the respective dungeon floor, and these can be monsters, potions, treasures, or dragons. You then use your Party Dice to defeat the monsters or take treasures and potions and decide if you want to push forward to the next level, knowing you won’t get any more dice for your party (unless an ability helps with that) while the Dungeon Lord gets to roll more. If you can’t go any further, you return to the tavern to rest. At the end of three delves, you add up your total amount of experience points to see who won, or, if playing by your lonesome, just feel really good about how you did regardless. The tricky part about each delve and deciding to go further or retiring to the pub for some mead and meat off the bone is dragons. Each time you roll the dice and a dragon comes up, you put that dragon die aside in an area called the “Dragon’s Lair”. Once you get three dragon dice in there, you must fight the dragon after dealing with the main set of enemies. To take down the dragon, the player needs to use three different types of companion party dice; if they can’t, they are forced to flee back to the tavern and end their turn, gaining no experience points. Generally speaking, most teams aren’t able to deal with a dragon until their third and final run, so it’s best to avoid early on. 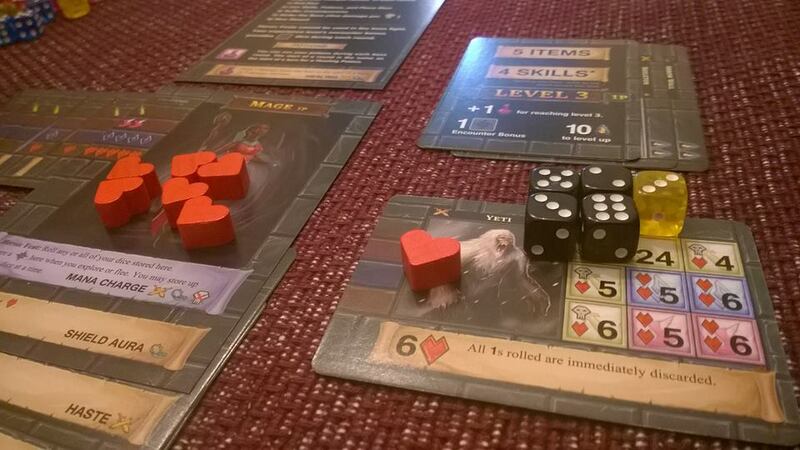 Dungeon Roll is at once both a simple and straightforward game, but also confusing and unclear in spots. I re-read the instructions several times and even watched a YouTube video or two before playing once, but still don’t feel 100% confident I know what to do rules-wise in every scenario. I’ve played it solo and competitively against Melanie, and both formats are enjoyable and come with their own strategies for success. I do wish the rulebook elaborated more on some of the rules or provided example scenarios of what to do and when. For instance, I still am not sure what the point of sacrificing a party die for a potion that brings back a single party die. I guess that’s for if one really wanted a champion before on to the next dungeon floor. Otherwise, it’s an enjoyable experience that is easy to travel with and full of replayability. The art on the hero avatar cards, done by Ryan Johnson, is stylish and cool, easily standing shoulder to shoulder with other card-based fantasy games like Magic: The Gathering and Lords of Waterdeep, and there is a good breakdown of genders and races across all the classes. If you know of any other single-player board/dice games similar to Dungeon Roll, please, by all means, leave me some recommendations in the comments below. I’m up to try anything, so long as the game itself isn’t made up of a thousand tiny individual pieces that need to be hand-painted to provide personality and the rulebook is not longer than Bone‘s total page count. Oh, and I already have a copy of Cthulhu Dice. Otherwise, suggest away.